I think I've probably mention it before and it probably come up in a few of my haul post but Ijust love anything that's creepy and cute at the same especially anything with skulls on it. Suddenly BAM!! Etude House comes out with this ridiculously cute collection!! Keep on scrolling for the products!! OMG HOW CUTE ARE THESE!!! There are two types of eyeshadow palettes. The mascara comes in Black and Brown and I never tried any Etude House Mascara before but it's supposedly quite good. I think I'm gonna go for the Long Lash one. The cream blushes comes in a red and pink tone. Should I get the red one?? There are only two shade on these and I wish it comes in a darker color. From the description I think it has a sweet scent. There's also Pink Skull Nail Stickers and Nail Polishes but it's not available yet on their website. I'll update this post when it's available. 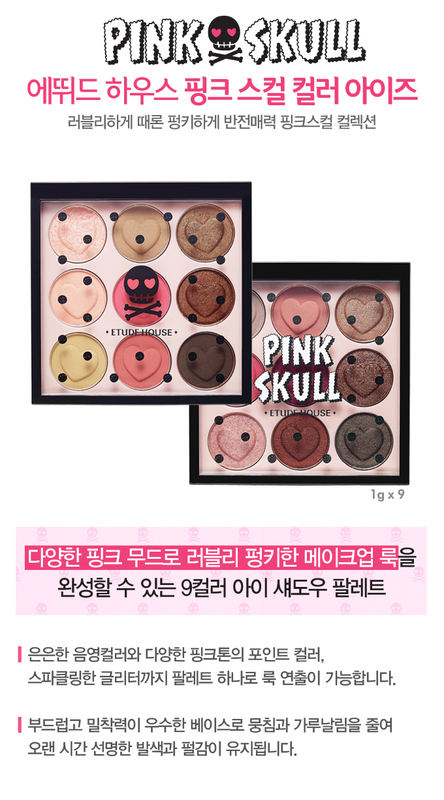 Jeon So-mi from I.O.I is their model for the Pink Skull Collection.